One of the most popular hair clinics in Hungary visited by French and UK patients. Excellent customer care adds to their professional attitude paired with very good prices – you can save up to 70% on UK hair replacement cost! Winner of the prestigious 2016 WhatClinic Customer Service Award, HairPalace is a hair clinic that certainly stands out in the field of hair transplant with their many patient success stories, state-of-the-art facilities, and patient-oriented approach. HairPalace is one of the most successful and friendliest hair clinics in Budapest, where you can save thousands of pounds on your hair transplant by choosing one of the attractive hair transplant packages specially created so that you won’t have to spend extra time searching for accommodation or managing your airport transfer. HairPalace’s hair transplant packages are created to meet customer needs depending on how advanced their hair loss problems are and how many numbers of implanted hair they will need. 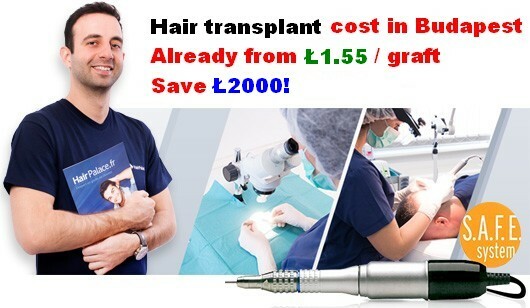 The price of the packages ranges between £1,400 for the smallest package that includes 2000 transplanted hairs and £3500 for the biggest package, which includes 6000 transplanted hairs. All packages include accommodation in a 4-star hotel in Budapest for 2 or 3 nights, depending on the hair transplant needs of the patient and the chosen package, 2 airport transfers from and to the airport, pre-surgery consultation, the surgery as per the treatment plan, 2-course lunch, medication package, written guarantee, and post-operative care. As a result, you’ll only have to book your flight to Budapest, and the staff at HairPalace will take care of the rest. After the intervention, patients receive a written guarantee stating that if 80% of the implanted hair does not start to grow within a year following the procedure, the clinic will re-implant lost hair free of charge. 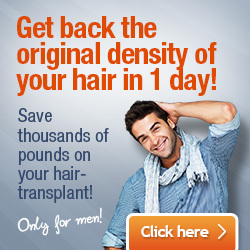 At HairPalace your hair transplant will be carried out in line with the latest hair transplant technologies. The clinic applies the FUE Safe System hair transplant method, which significantly reduces recovery times and leaves no visible scarring. The treatment plan and the prices include the necessary periodic post-operative follow-up meetings one week, three weeks, three months and one year after surgery. Apart from affordable prices, attractive hair transplant packages, and exquisite services, HairPalace provides consultation for patients based in the United Kingdom. The clinic has four consultation locations in the UK in the following cities: London, Birmingham, Manchester, and Leeds. Thus, British patients don’t have to travel to Budapest for a consultation and a personalised treatment plan. This consultation is necessary to assess the condition of the patient’s scalp and to decide whether they qualify for a hair transplant. If HairPalace specialists determine that a patient is a suitable candidate, a treatment plan will be drawn up by the specialists at the Hungarian hair clinic. The treatment plan will contain all the necessary information and all costs beforehand. Patients don’t have to worry about hidden charges or extra fees. Given that HairPalace is already a hair clinic that has built an outstanding reputation for itself, and it has a significant British and French customer base, reviews from real patients are available on hair clinic review sites and other sources. You can also take a look at before and after pictures of procedures on HairPalace’s website.